Born in Hamburg in 1984, Simon Bode started his musical education with violin and piano lessons, going on to win several awards on both instruments. He later began his vocal studies with Professor Charlotte Lehmann at the Hochschule für Musik and Theater in Hanover. 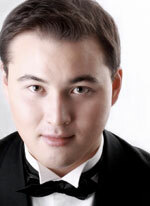 The young singer has won many prestigious prizes early in his career, including the Hans-Sikorski memory-prize of the Deutsche Stiftung Musikleben, awards from the Walter Kaminsky Foundation, the Niedersächsische Sparkassenstiftung, the Yehudi Menuhin Foundation ‘Live music now’, and the Jürgen Ponto Foundation. Accompanied by Nicholas Rimmer he was a Prize-winner at the 2009 International Schubert Competition in Dortmund. He is also a scholar of the German National Academic Merit Foundation. Since 2010 Simon Bode has been a member of the opera studio at Oper Frankfurt, making his critically acclaimed debut as Belmonte in Christof Loy’s fêted production of Mozart’s Die Entführung aus dem Serail in March 2011. He is also a regular guest at the State Opera in Hanover and the State Theatre Braunschweig, notably as Gomatz in Mozart’s early opera Zaide. Aside from opera, Simon Bode is a dedicated Lieder singer. He regularly collaborates with pianists Graham Johnson, Igor Levit and Nicholas Rimmer, and bayan player Elsbeth Moser, performing premieres of contemporary works as well as more familiar repertoire. He has given recitals at the international Rising Stars festival ‘The Next Generation II’, the Schleswig-Holstein Music Festival and Festival Mecklenburg-Vorpommern and has made numerous recordings and broadcast appearances with the Norddeutscher and Bayerischer Rundfunk.